Three stories, three decks, three bedrooms and three (and one half) baths for the remodeled 1155 Vallejo asking just under three million ($2,995,000) in Russian Hill. near where i used to live..oh man…would love to have this place. What the heck? An actual workable kitchen! I thought those were only available in lower priced homes. How about that nighttime exterior photo! We usually get get dual exposure composites for inside-to-outside shots (to better showcase the views). This one appears to be an outside-to-inside dual exposure composite (either that, or the garage is radioactive). Milkshake, I noticed that too. I think it’s a nice looking place, I like the openness of it. The kitchen is ok… I’m not a huge fan of under-the-counter microwaves, nor do I love the burners in the island. I also suspect it’s not comfortable for people to sit at the island bar while someone is cooking. You definitely can’t fry anything. Also, because the vent is in the middle of the ceiling, you can’t easily change the location of the stove if you actually wanted to move it at some point in the future. All that said, it’s still better than some of the other horrible kitchens posted here. I agree with you sleepiguy. If you have to have something on the island, the sink is a better option. This looks like a straight photo to me. The difference in the color casts (garage being noticeably bluer) is probably due to different interior light sources. The house probably has normal warm cast (incandescent or CFs that emulate the same spectrum) while the garage probably has ordinary 4′ fluorescent workshop tubes which are both bluish as well as being potentially very bright. If there’s room for an island, I definitely put the sink there. It just seems more intuitive to me, anyway. Since most time spent cooking is in the prep work, not the actual cooking, I prefer to be facing into the room to chat with guests or family (or watch TV) while doing the prep on the island. Then you can just wipe the mess into the sink. Here, you have to do your prep with your back to the rest of the room. Then, once you start cooking, you’re talking to people through a fog of smoke, sputtering grease, and the whir of the overhead vent, which really needs to be turned on full blast to keep the room from filling with smoke. “Wet” islands are much trickier to plumb than “dry” islands due to waste and vent piping. Designers usually all prefer the sink in the island until the owner get’s the estimate for the plumber. He can put a gas line in the island for about 10% of what it costs to go wet. The cost of the loop vent to the island sink won’t budget bust any high-end kitchen. LOL @ Steve. So true! Of course the sink is better on the island if you have to have an island, but otherwise this is better than 90% of the high-end home kitchens I’ve seen on this site. And if you can afford this kitchen (and house) you can afford to put a Fry Daddy on the countertop, so the splattering grease on your guests problem is easily solved. Milkshake, I’m still thinking two exposures. Notice the effect of the light from the chandelier on the long exterior exposure. 6 pictures? Dude forgot to charge the Canon? It looks like they’ve added more photos to the realtor’s website. I agree with others: one of the first functional luxury kitchens I’ve seen in a long time. Logically, I agree that having the stove in the island would be worse than a sink there… however, I have my stove similar to this, with 4 chairs facing the stove. I love it. I am a huge cook. I cook all the time, and have guests over for dinner at least once a week, sometimes 3-4 times a week. People sit in those chairs all the time. I’ve never once had a problem. And I’ve cooked things that “sizzle” all the time. Yesterday I fried 3 lbs of bacon on a skillet with the love of my life sitting in the chair doing work on the computer. (I made a tub of potato soup for our Halloween Block Party). Not a drop touched even the computer. Think about your stove at your home; how often do you have to wash the wall behind your stove? my guess: not often… because it usually doesn’t splatter that far. If it did it would burn you too! In terms of prep work: you still can prep and face your friends. You prep to the right or left of the stove. You only need to have your back to them when you’re washing the food. so logically I totally agree that the sink should be there… but I love my current setup, and would hate to have the stove facing away from my guests… but that’s because a lot of the food that I cook requires you to face the stove. Someone should notify Benihana immediately! It’s really a process of elimination. If there is a window in the kitchen, the sink often goes there. Nice to look outside when you are peeling potatoes. And the light is often better. Furthermore since you don’t usually put cabinets over the sink, the window location makes a lot of sense. A cooktop at a window is a hazard. Not sure if it is actually against code, but it’s not a great idea. You might try opening the window while boiling a pot of peas and come to grief. Or put up curtains that risk becoming sheets of flame. Stuff like that. 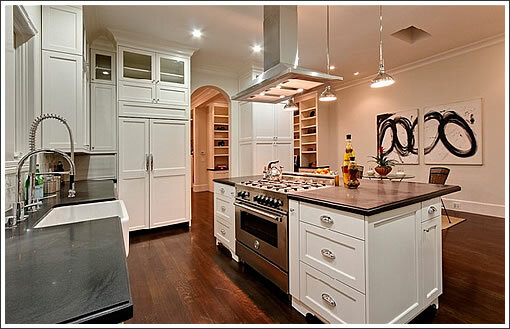 So if you have an island and a tight kitchen that requires that something go on it, it’s usually the cooktop. I’ve had a kitchen with a sink on the island and one with a cooktop on the island. They both worked just fine. One caveat, gas cooktops on islands tend to be overly affected by breezes from open windows. Maybe next time they could take the time to wipe off the countertops before they stage and photograph the space. Guess they are in a hurry to move this place. Our power of threes theme continued today for 1155 Vallejo as its sale closed escrow with a reported contract price of $3,100,000 three weeks after hitting the site. Confirmed! Sold within 48 hours of hitting the market with a pre-emptive over-asking offer. 14 day escrow…ALL-CASH > $3.1M! Doesn’t get much better than that. Well it was either a 14 day escrow or sold within 48 hours, but not both. Can anyone confirm that it was all cash? Congrats to the seller, sounds like they made out well here.